Folks - ZineWiki - the history and culture of zines, independent media and the small press. 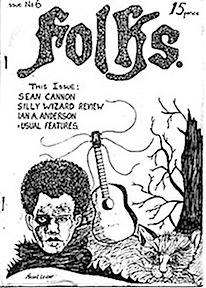 Folks was a folk music zine by Pete Willow. The first issue was published in 1978 in Coventry, UK. Folks covered the Coventry folk scene, the musicians and clubs of that period, and included club listings and reviews, as well as articles on the history of the Coventry folk scene. Also featured were spotlights on local songwriters, such as Rod Felton, Al Goodwin, Dave Parker, and Martin Prue, and their songs were included in the zine. Other articles featured musicians such as Steve Adams, Ian A. Anderson, Rob Armstrong, Les Barker, Sean Cannon, Jackson C. Frank, Pete and Sheila Rigg, John Shanahan, and Alan Whittle, among others. Contributors of articles included Ben Arnold, Dave Coburn, and Pete Willows, among others. Contributors of art work included Dennis Clarke, Hazel Lester, and Terry Sycamore, among others. Contributors of poetry included Rod Felton, Nick Lawrence, Pete Rigg, and Pete Willow. Ten issues were released before the last issue appeared in 1980. This page was last modified on 29 March 2018, at 13:05.